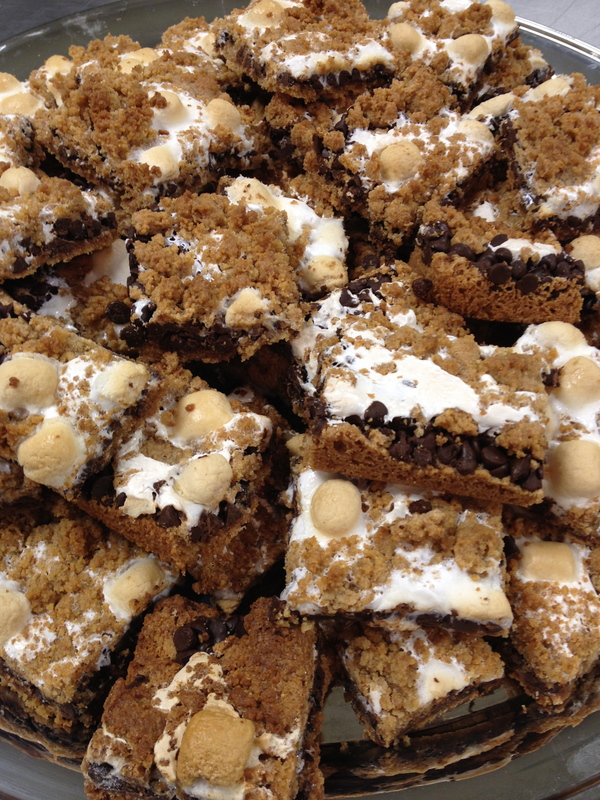 Did you enjoy the S’mores Bars and Rice Krispie Treats at dinner last night? We made 480 of each kind of bars and not a crumb was left behind. Tony’s smoked meatloaf also vanished by 6:00! Apologies to those who came to dinner for the last 15 minutes and missed out, but we hope you enjoyed the Cheesy Church Potatoes (our own special version of the hashbrown casserole) and the fruit salad and the Dijon Green Beans. Use a 12x20x2 inch cake pans (or 2 9×13 pans). Cut 6×10 yields 60 bars. Reserve 2 cups of this mixture and press the remaining in well-greased pan for crust. The reserved batter will be crumbled on top later. Wet back of metal spoon and use to lightly spread cream. Bake 17-22 minutes at 325* convection, or until marshmallows are puffed and light golden brown. Cool at least 30 minutes. Cut into bars. I concur with that chubby fellow up there. Oh boy indeed. Thanks Raych! Loved your review of Animal, Veg, Miracle on the blog, oh by the way. I’m big fan of all Ms. Kingsolver’s books.